« Jay’s print BO col : Akki’s Tasveer gets cut to size! What is ‘masala’ cinema? At some point this question should be raised with a certain force. The responses in turn would hopefully address what this ‘haunting’ signifies at the current moment. For it is a ‘haunting’. We are not ‘done’ with ‘masala’ cinema’. We have not yet exorcised the ghosts. Minimally, we continue to remain confused about what this ‘heritage’ means. ‘Bollywood’ cinema (which is not the same as Bombay cinema) has in recent years wrestled more explicitly with this legacy and the results have been on the whole quite mixed. It seems to me that the most fundamental principle that contemporary filmmakers and often afficionados have forgotten about ‘masala’ cinema is that it was always intended to be taken very seriously. Certainly audiences did so when this brand of cinema was at its peak. There was a strong cathartic principle to films in this genre (and it is by no means clear that the word ‘genre’ can be used for a cinema which was really a ‘pastiche’ of genres or a bleeding of one into another, much as in Shakespeare). All sorts of political struggles were represented in those films. The narratives often relied on mythic referrents. This was not a cinema one laughed at, it was a cinema one laughed with. Much like ancient Greek tragedy the best examples of the masala tradition were powerful emotional experiences not reducible to models of pure consumption. Finally, masala cinema was much variegated. 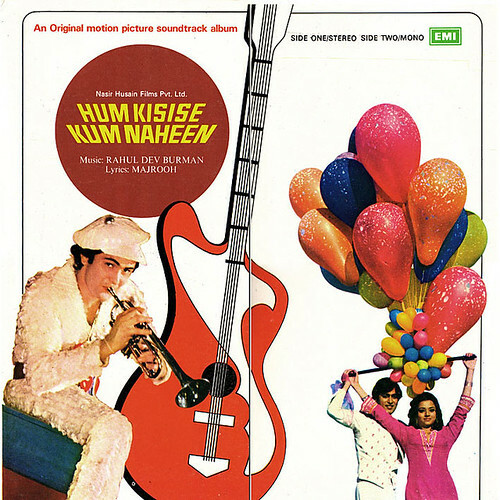 A Manmohan Desai was radically different from a Prakash Mehra, a Yash Chopra profoundly so from a Nasir Hussein. The examples could be multiplied. Another misreading of this tradition seeks to obfuscate the differences and simply present all these earlier films as one and the same. Masala cinema waned after the early 80s and eventually survived through this decade but especially in the next through B grade manifestations. No serious talents seemed to be capable of mining this rich legacy in the 90s and since then some new directors have only gingerly approached the ‘genre’. Most often they have been in the business of paying ‘homage’ and almost equally often they have taken the route of ‘parody’, something that based on this discussion should not come as a surprise. The perspective on ‘masala’ today is essentially one of condescension where one somehow enjoys the movies while laughing at their ‘logical lapses’ or their ‘overblown’ sense of drama or even their ‘larger than life’ characters. In other words the cinema might be ‘consumed’ like junk food but must not be taken seriously. In a more critical register one could argue that a certain Bloomian poetics of influence plays itself out here. ‘Masala’ is what one always seeks to repress. Better still the ‘forgetting’ of masala in the 90s led to a ‘return of the repressed’ in the new millennium. 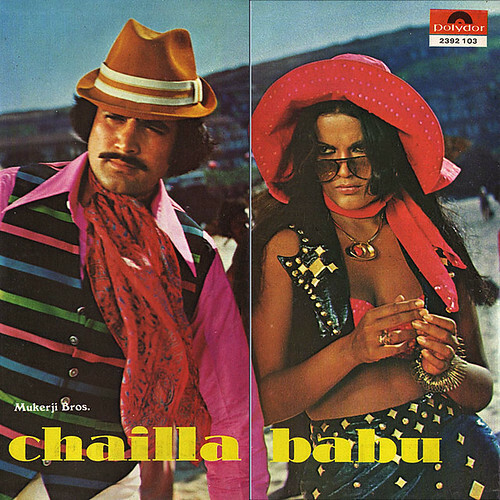 From the perspective of the present the original masala films were already ‘parodies’ in some form or fashion. How then does one parody these if one approaches the subject from such an angle? I would suggest that some of the recent films have struggled with this problem. In Farhan Akhtar’s Don for example there is the attempted ‘refining’ of a masala classic. There is simply no realization that what often seems campy in the original is so by design and is in fact a strength of the film. Masala cinema often collapsed distinctions between terms such as ‘A grade’ and ‘B grade’ cinema. The latter was always folded into the former. Another way to understand it would be to suggest that the distinctions were never as clear cut as these might have been in 70s Hollywood (the ‘Western’ obsession with ‘classification’ perhaps offers another example in this sense!). Let’s take a small example from the films and see how the translation works. There was an old joke about the original Don. People wondered how many briefcases Don had if these kept exploding from time to time. In Farhan Akhtar’s Don when we are at the dead center of Don’s lair we see a whole set of identical briefcases. On the one hand this is an inspired move and really one of the genuinely zany moves in an otherwise insipid film. On the other hand one sees how Farhan tries to explain away or ‘rationalize’ something in the original work. Those exploding briefcases must have a reason or logic. This misses the masala encounter. There can in fact never be any explanation for Don’s briefcases! In a more Deleuzian sense Farhan is guilty of going to the ‘outside’ of the frame when in fact ‘masala’ cinema gathers its sustenance from the notion (also Deleuzian) of an ‘absolute outside’ of the frame. In the former instance one might account for the briefcases, in the latter case one cannot. To ‘refine’ masala cinema is any sense is to completely falsify it. Another approach is suggested by Shaad Ali who remains at this time a strong reader of the tradition even if he is also problematic in other ways. Bunty aur Babli is perhaps the closest one gets to 70s cinema in this vein without the ‘apologia’ that is often offered by way of a spoof. BnB is a comedy for sure much as many Desai films were comedies, which is again not to suggest that these are not meant to be taken seriously. ‘Comedy’ in a Desai film is often the absence of ‘tragedy’ much as this term was defined in classical Western registers. Richard Pena thinks of all Desai films as comedies, a labeling that one can accept with important caveats. In any case BnB summons that world for us. It is unapologetic masala even if the absence of the all important action element here is perhaps a bow to Yashraj interests. More importantly Shaad Ali makes the masala his own which is to suggest that the film is not literally old wine in a new bottle. In Shaad Ali’s next, Jhoom Barabar Jhoom, a film which cannot be adequately summarized with brevity, the director seems to be resorting to parody but as opposed to his peers he greatly alters the terms of the debate. There is a ‘fold’ effect apparent in JBJ in many ways. 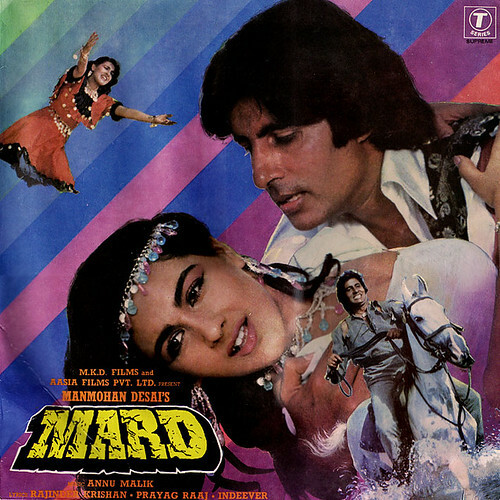 For the purposes of this discussion Shaad grafts masala codes onto a quintessentially 90s love story. Situationally the film mimics the latter but the characters often behave as if they were conscious of having wandered out of a 70s masala work and into a 90s film. Rather than a deconstruction of masala this film involves a parody of the 90s by way of masala. The joke is really going the other way! As I have just indicated one cannot hope to do justice to this rather deceptive film all at once. But it might still be plausibly argued that Shaad Ali for all his genuine achievements in these two films nonetheless privileges comedy as his access point into the earlier tradition. After all, what about the high drama of those earlier films? Shaad Ali’s wager remains open in some sense. Nonetheless one of the reasons I am ambivalent about the efforts of someone like Shaad Ali though I might otherwise like the films is because it seems to me that you cannot quite rescue masala cinema with the tongue in cheek take. For one this kind of self-parody is already present in that genre! It’s a bit like Leone’s Westerns that are very dramatic and very tongue in cheek at the same time (in his later Westerns he privileged the latter pole of the equation even more). But leaving this aside the wager in a Tashan or a JBJ is that masala cannot perhaps be taken too literally. I would however argue that masala is precisely what must be taken very seriously! 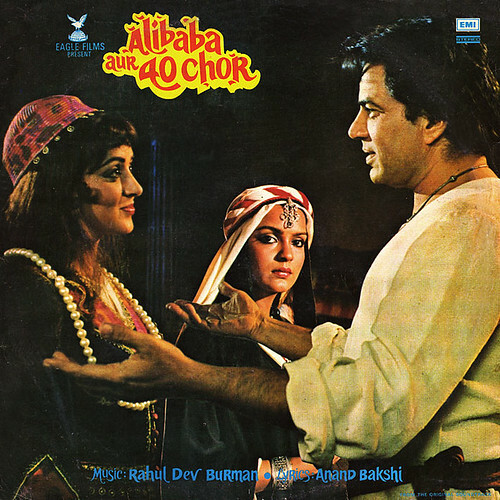 An important connecting link here has been once again Bachchan and the Desai intervention in his career. Beyond a point masala cinema was converted into ‘comedy’ by the Desai/Bachchan combo. I don’t mean the obvious comedic elements that surfaced in these films to ever increasing degrees but the fact that these films were ‘comedies’ in a more structural sense, even in a classical sense. The contemporary directors feed off this history when they approach masala cinema. The Deewar/Zanjeer kind of more intense mode is rarely practiced though a Ram Gopal Varma picks up on this on his best days. Santoshi made in many ways a perfect masala film with Khakee. Farah Khan in both her earlier Main Hoon Na or in the recent Om Shanti Om has not offered a solution either. The director’s interests have always been rather more superficial in terms of ‘re-igniting’ the genre. Once again one witnesses ‘parody’ as the ’safe’ option. But the problem lies elsewhere. Both Main Hoon Na and Om Shanti Om are really 90s films in the guise of masala homage. The former is quite uninteresting in this regard, the latter is also a mixed achievement though with surprising results on one level. Farah Khan might have inadvertently done masala cinema a favor. How? No one having any real familiarity would recognize any authenticity in Farah Khan’s spoofing of masala in OSO. For one there are all sorts of anachronisms. The initial portion of the film is set in 1977. Karz was not being shot at the time. Nor were Rajni-like Southern stars known in Bombay circles at that point. In fact Rajni’s eventual iconic avatars were still in the future even in Tamil cinema of that period! Similarly Shahrukh refers to Kamal Haasan in the same breath as Gemini Ganesan in 1977 when this kind of juxtaposition would have made far more sense some years later when Kamal had made more of a mark in his career. 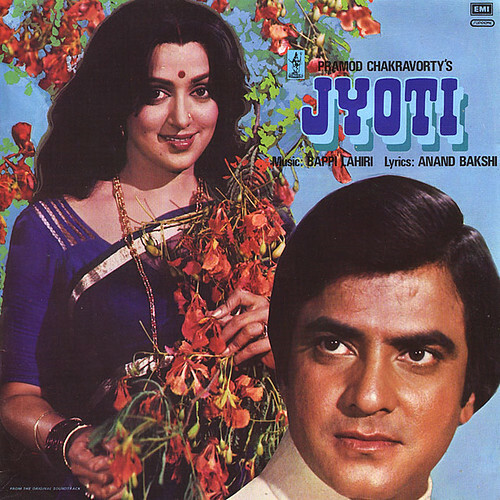 Shantipriya (the 70s actress who is the first incarnation of Deepika Phadukone) appears in a film looking strikingly like the Aishwarya Rai of Devdas. 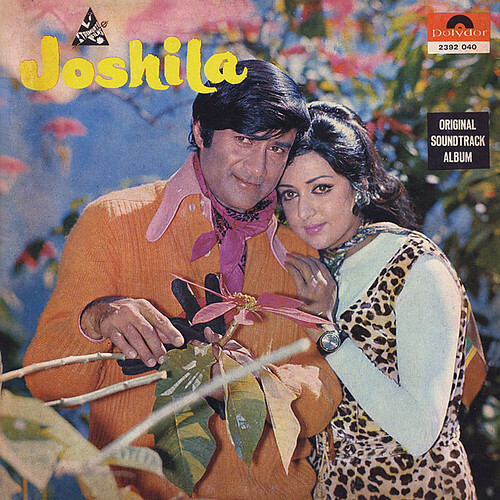 That kind of Bengali look was again not very current in 70s cinema. A director like Shakti Samantha who sometimes represented a Bengali milieu never indulged in the Bhansali sort of glamorised image of the the Bengali ‘parineeta’ that seems apparent in that just cited moment. The Pakistani actor Javed Shaikh plays the late, somewhat pathetic Rajesh Khanna, and he seems completely wrong for the part. 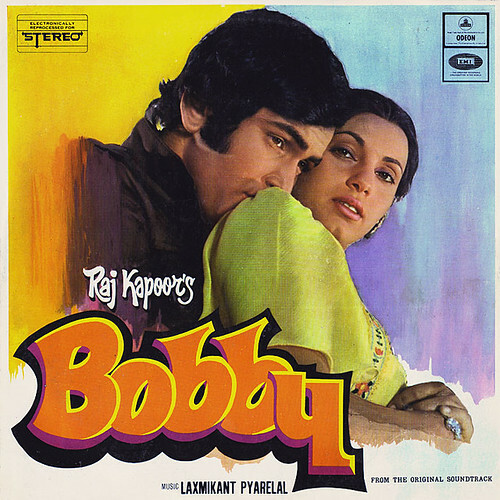 The Rajesh Khanna and Jeetendra that show up in the song with Shantipriya seem to belong to very different eras. A very young Rajesh Khanna is juxtaposed with a much older Jeetendra who seems to be more suggestive of the 80s. A Mithun-like figure shows up who again was not known in th period represented in the film and gained prominence later and was really a truly 80s phenomenon. One is even more surprised to see a Govinda figure here! So on and so forth. The 70s and 80s are combined into one period in Farah Khan’s imagination when there is a world of difference between the two decades in every conceivable sense. It is not that I am missing the forest for the trees here. Even a spoof must have a certain authentic relation to what is being spoofed. Otherwise the spoof falls flat. Or at best it becomes a collection of gags or curiosities. The more interesting element that emerges from this entire first half of the film is the extent to which Farah Khan’s representation of the 70s tradition is really a parody of B or C grade films of that period. 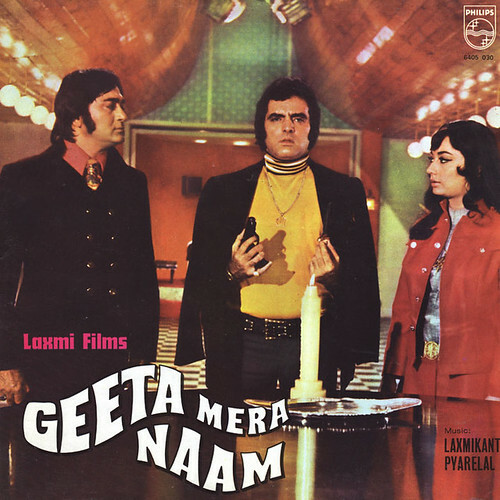 Or at best a parody of the campy elements of masala cinema. This is not a homage to a glorious tradition but a pastiche of the worst excesses of the period. 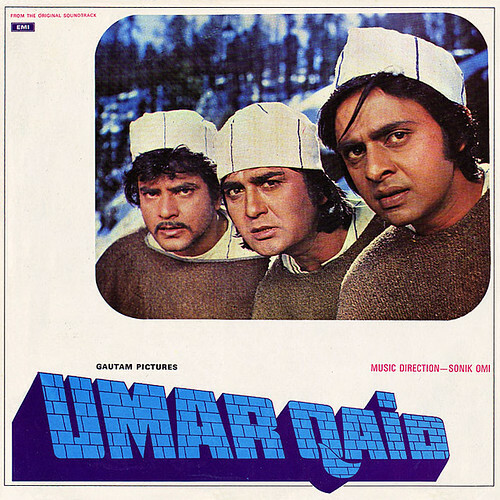 Not surprisingly Manoj Kumar occupies center stage or Dev Anand crops up. These are soft targets. 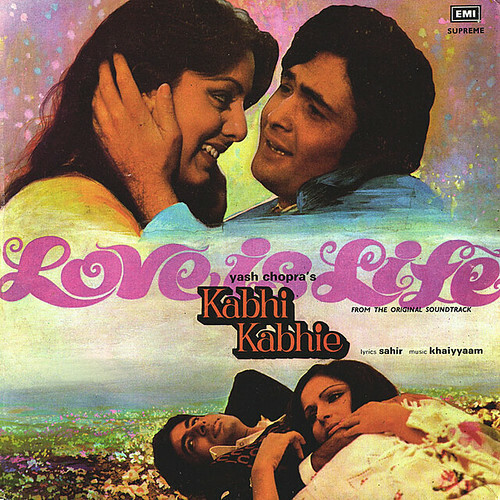 Leaving this aside one of the most important features of the 70s tradition was the city of Bombay that appeared in film after film and whose topgraphy was linked to a greater degree with the films of that period than any before or since. Unfortunately all of Farah Khan’s homages take place on one or two sets and there is little sense of the city outside. The director fundamentally offers no more than the pastiche equivalent of jokes that later generations often made about the tradition. The older Rajesh Khanna or Dev Anand or Manoj Kumar were always the ‘bad’ 70s as opposed to the good 70s of a younger Rajesh Khanna, a Dharam who was transforming himself from 60s romantic or family film hero to action star, and of course Bachchan. Dharam shows up briefly in the film and thankfully Rishi Kapoor is represented by his Karz clip that begins the film. Amitabh Bachchan is completely absent. I think this is important. Bachchan is still so absolutely central to our concerns that he resists completely any attempts at parody. 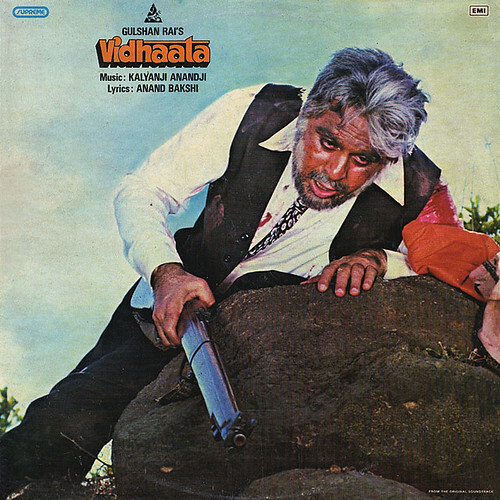 Nonetheless, absenting Bachchan from any 70s homage is to more or less collapse the ‘homage’ even before it has begun. 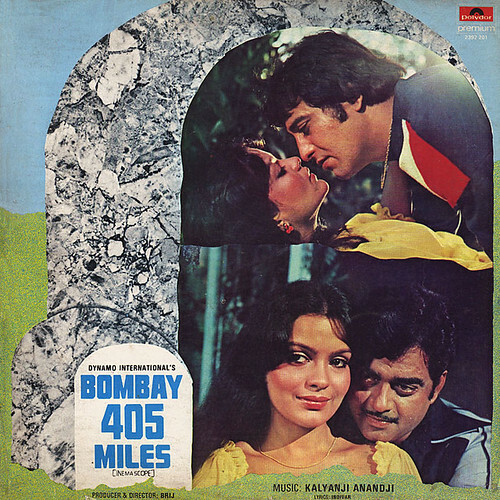 This is therefore the film’s blind spot but also a point to be reflected on in serious fashion inasmuch as it highlights a whole set of issues — the twinning of Bachchan and ‘masala’ in the minds of many, the extent to which Bachchan today represents almost entirely on his own Bombay film history, all of this therefore becomes problematic when one ‘deals’ with ‘masala’ because one also has to account for Bachchan’s ‘permanence’. So on and so forth. As a political matter Farah Khan is doing no more than playing to audiences who either remember the 70s imperfectly or not at all or have not been exposed to this decade in the first place. It is somewhat ironic that the director has such great reverence for Nasir Hussein because her perspective on the 70s relates far more to this director and his brand of very campy and lowbrow bourgeois masala as opposed to the peaks of a Desai. The framing device for this film is of course the reincarnation angle and the director is on firmer ground here in terms of homage as she ‘refers’ to Karz in the opening sequence and then more obliquely to Madhumati and even Kudrat in the closing moments. But otherwise the director completely mishandles this aspect of the narrative as well. The theme is never approached with much seriousness and simply becomes a casual plot device to bookend what are essentially a series of gags in both halves of the film. 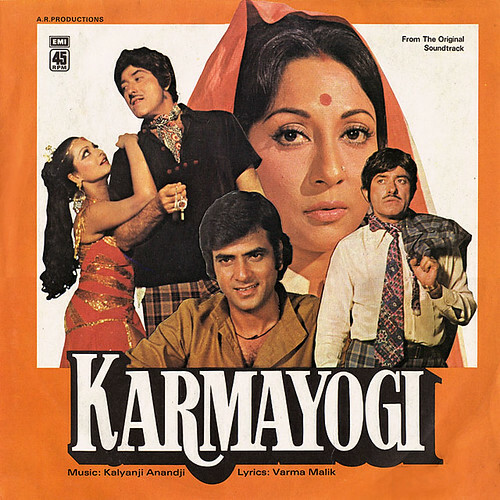 The reincarnation idea which has always appeared dramatically in earlier films, has always retained a degree of ‘uncaniness’ even in a very masala venture like Karz, is competely diluted in OSO by the constant spoofing in both halves of the film. It is hard to marry comedy with drama as any good student of Manmohan Desai ought to have learnt. Sadly Farah Khan is not that student. By introducing the reincarnation plot device and aligning this with a parody she doubles her bets and completely fails to do justice to the former. The film simply does not have the gravitas to deal with the demands of such a subject. OSO is many ways represents the perfect example of everything I’ve been critiquing about the latter day reception of masala cinema. It is completely symptomatic of the confusions that pervade the understanding of this genre in contemporary ‘Bollywood’ and its audience. As I suggested earlier one must be careful not to ‘falsify’ this rich tradition in the process of ‘refining’ it. ‘Masala’ cinema does not involve a storyline onto which various ‘excessive’ elements are then added on to increase the mass appeal of the subjects. Those seemingly ‘extraneous’ features are precisely the point (this is of course not to deny ‘bad masala’ which too is amply in evidence in the 70s). By way of a literary analogy I would offer the example of Tristram Shandy where the digressions are the novel. I am of course not going to pretend that Desai is somehow Sterne’s inheritor (!) but I do think one might bridge the gap using Deleuze once again whereby both Sterne and Desai could be examples of ‘lateral’ plot development (or writing) as much as ‘linear’ in a somewhat more traditional sense. In a similar vein I have also long believed that is entirely incorrect to see Indian cinema with its song interludes as equivalent to Hollywood musicals. It is once again a kind of ‘lateral’ movement that incorporates the songs into the major narrative. Of course the songs often work in linear ways and serve to advance the plot. But even when this happens there is still a ‘lateral’ dynamic at work to the extent that the song situation also disrupts the linear chronology of the film. Again this is a subject that would require much thought. ‘Masala’ in Bollywood suffers from two afflictions. One is the distance which current bourgeois audiences (I mean especially target multiplex viewers) have from the tradition. In Tamil cinema, to take the most obvious example, that heritage has never been lost and has been ‘upgraded’ at every point. Now one might not be a fan of the genre but that’s a different point. One does have a choice to see what a healthy masala tradition would look at present. Unlike Hindi audiences that are a often a little embarrassed with what they perceive to be ‘crude’ elements in those films from the comedy to the action sequences. What is however missed is the extent to which masala depends on such a combination of the high and low. This is why Deewar is not really a masala film. It is akin to Shakespeare in many ways where you have the most lofty thoughts expressed in the most exquisite poetry in one moment and then you suddenly get the most obscene sexual puns! The overall effect of Shakespearean drama depends on such a juxtaposition of elements. These are in many ways questions of ‘filmic’ time. The comedy portions rudely interrupt the more serious dramatic ones and vice versa. The same is true for masala cinema. The genre operates in linear fashion on the one hand but also laterally in other ways. There are sequences that take the story forward and others that simply keep it ’still’. But both are equally necessary. What you see with a certain kind of cinema is that the comedy bits are taken out, in another kind it’s only the comedy. The other vital ingredient is always missing one wat or the other. Masala cinema is therefore always a bit of a roller-coaster reader. It’s not just that too much happens (a thriller could do as much) but that it happens in different ‘time zones’. It is then the job of the director to compress these different ‘zones’ into one at the very end of the film. Of course this also involves a literal spatial element as well. Characters who start off within a common space, are then scattered, but reunite at the very end. The ‘communal’ (in the sense of community) space is therefore always present only as an ideal. Once in the very early portions of the film and then in the film’s ‘afterlife’ which we again imagine but do not actually witness. In between there is only to introduce Hamlet once again ‘time out of joint’. Similarly the technical values to the extent that these might be judged ’substandard’ (this is not true for all masala) are also very much a part of the film’s fabric. This is why the idea of updating Don the way Akhtar tried to do also misses the point. 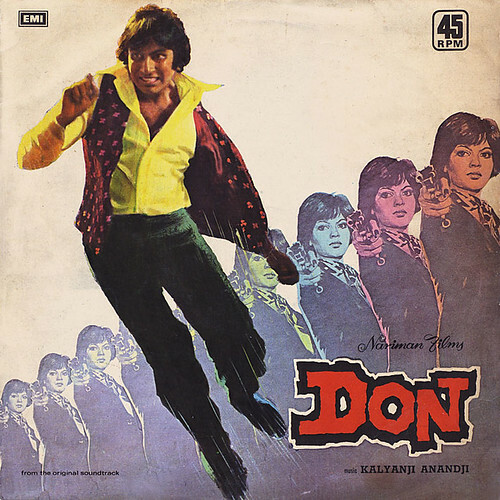 Don works as a kind of B movie with a megastar at its center. Don is not Bond even if Akhtar imagines this to be the case! But the other affliction is that masala cinema depends on a notion of the ‘epic’ that is sadly completely foreign to the sensibilities of most contemporary multiplex audiences (again within Bollywood). One understands that genre fashions change with time. I don’t lament the loss of masala simply for its own sake but because of what it represented which is to my mind the most inclusive and politically progressive cinema in Bollywood film history. Despite all the caricatures and all the stereotyping masala cinema ‘represented’ more groups and more identities than any other before or since. It was simply a more variegated world. A richer cinema. Similarly when I bemoan the loss of the ‘epic’ I am also referring to ‘rootedness’ and cultural artifacts that have informed Indian sensibility in many ways, whether we know it or not. Masala engaged with this as well, or took up this heritage consciously. The film scripts that I would consider ‘great’ from the 70s married this epic inheritance with Western romanticism and Shakespeare and so forth. This was ‘real’ writing not just a cobbled together script that could be written in ten minutes by any one of us here. And it is hopefully not ‘judgmental’ to suggest that a film tradition that fed off the Mahabharata was ‘better’ than one that relies on Saved by the Bell (the ‘college’ in KKHH? The entire ethos of all these romances (which even if one enjoyed them at the time are really no more advanced than Disney teen romances) operates at a somewhat infantile level. People are are all too happy seeing Hollywood Generation X films made into small budget clones in Bollywood to ever dream of returning to the epic challenges of J P DUtta (in the 80s to be exact.. the one director who did ‘update’ masala but was perhaps too late..). No audience nurtured on Kuch Kuch Hota Hai will ever be able to digest Ghulami! I was rather surprised to see Khakee under-perform at the time. It did reasonably well but it really should have been a massive blockbuster. This ‘heart of darkness’ re-writing of Sholay was too much for ‘multiplex’ audiences. We also continue to witness a set of attitudes where belonging to upper or upwardly mobile classes insist on speaking for this abstraction called the ‘common man’. Somehow ‘we’ are privy to his (it is never a common ‘woman’) dreams and desires and ambitions. Somehow he is only ‘elemental man’ interested in fulfilling his most basic wants and unable to indulge in fictions of any kind in life. As long as he gets his fantasies fulfilled by way of masala cinema or Dhawan or Akshay Kumar’s comedies he is happy. Meanwhile we ’sophisticated types’ watch Karan Johar! The ‘common man’ in this way becomes a ’site’ for the fantasies of bourgeois types like ourselves! I think in many ways those films from the 70s (specially the Bachchan films) represented more universal struggles, not just those of the ‘common man’. The ‘common man’ probably realized on day 1 that he was not ‘like’ Bachchan in any sense! Bachchan was always too ‘extraordinary’ or too ‘God-like’ to represent the ordinary even if he fought those ideological battles. But it’s not just his cinema or even masala cinema. The Amol Palekar comedies were for example delightful fictions but also rooted ones in profound ways. Isn’t it ‘reality’ anymore to imagine someone finding it very hard to get on a bus every single day because of crowds, the jostling and so forth? Does no one take trains in Bombay today? Does no one live in a Bombay chawl anymore? It’s just that a Johar or anyone else doesn’t represent this aspect of life (this is till well and alive in for example Tamil cinema). The earlier films did that. There was always a slice of life relevant to one social group or another but the issues were universalized. So Piya Ka Ghar is not about life in a ‘chawl’. It’s about a couple who can’t ‘do it’! Surely this situation is not relevant only to chawl dwellers?! I too enjoy a film such as Kabhi Khushi Kabhie Gham for many reasons but that fiction does not contain even an ounce of ‘reality’. Bachchan roams around in helicopters. Shahrukh leaves his house with no inheritance. Some years later he’s replicated his father’s lifestyle in London. Hrithik arrives in London. The next day he takes off in his own Benz. It’s plain silly. There is an ideological component here for sure but it’s one that excludes. Trishul was about rich people but the film contained very many real characters and there were unpleasant aspects of life that kept intruding on these characters’ lifestyles, in essence because these ‘rich folks’ had done things for the unpleasant to creep in from elsewhere. Nothing of the sort in K3G. You stay separated for 10 years. At the end of it you pat each other on the back and that’s the end of the deal. No real sense of loss or the ‘irreparable’. Consider masala: sometimes your mother died when you were young, sometimes your family was murdered, all the happy endings couldn’t quite make up for this loss. These strands of narrative or of emotional response made the works ‘universal’. It is not that these films were more ‘realistic’, just that the ‘stories’ triggered certain archives of human experience that always involve a sense of ‘cost’ which is very unlike the ‘cartoon’ world of Johar where everything can simply be ‘restored’. When one turns to Tamil cinema the nicest thing about it is the extent to which masala there is not an ‘issue’. It is as normal as any other genre! This is why I didn’t even notice Ghajini too much when it first released there. I did see it and didn’t think much of it. Because that tradition offers much better. But in Bollywood this film (of course I think it’s better in the remake) has all the shock of a seismic event and little wonder that it has registered one at the box office. An authentic one! In contemporary Bollywood such a film cannot be divorced from the entire history I’m talking about. Masala cinema (as I keep repeating) is about certain ingredients but also a set of aesthetic choices. But Hindi cinema was never able to upgrade masala after the early 80s and the genre more or less died out. In Tamil at least since the 90s there has been the slick masala film which contains all the ingredients of the latter updated for contemporary times. These films sometimes err more on the side of the Hollywoodized action flick but are equally often rooted products with discernible ‘mass’ strains. Of course masala itself has become a much overused and abused word. These days it’s intended to mean anything that has broad commercial appeal and has the song and dance stuff and so forth. But this isn’t really a precise definition of masala. Some masala examples in recent years are Fanaa (though this is a bit of a hybrid incorporating the 60s as well! ), BnB, LRM, MP. Even BnB and LRM lack the pure drama of masala though these are otherwise squarely in that tradition. Akshay’s comedies owe something to masala but are not complete masala products. Nor is OSO (MHN is more masala than this). One could get into other examples here. In addition to Khakee, the recent Ghajini offers the best path forward for a re-invigoration of the genre not least because it is unapologetic in terms of what it does (I have written on this elsewhere). As I have hopefully shown through this lengthy essay masala ‘stakes’ are well worth preserving. It is at any rate a legacy that keeps informing us in complicated ways whether we choose to embrace it as a ‘good’ or not. This entry was posted on April 8, 2009 at 7:28 AM and is filed under the good. You can follow any responses to this entry through the RSS 2.0 feed. You can leave a response, or trackback from your own site. Sticky on right hand side. 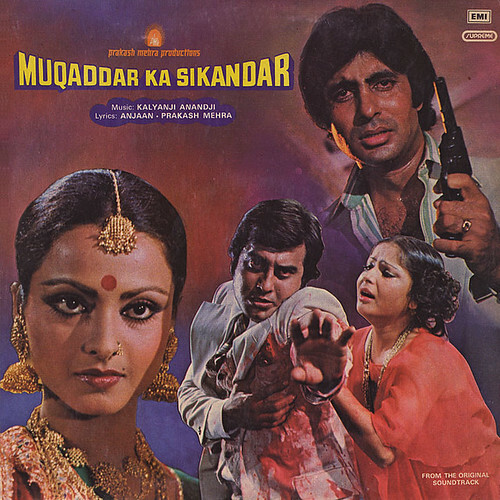 – The omission of Amitabh belies their tribute to 70s. I think it was a ‘camp’ decision on their part not to include him. – Farhan’s Don missed the bus. In a queer climax he shows the original Don to possess the CD. Now, that means ‘Khaike Paan’ was ‘sung’ by the original and not the duplicate! Farcical and absurd. The closest to masala I have seen is only BAB – some action could have helped as you rightly state. JBJ was too static and ‘cult’ if you may. Masala is always massy. There’re other points, but may be later. Munna, will act on your advice here..
Quite simply one of the most evocative pieces of writing on Hindi Film industry I have ever read. Yes, it is mostly about Hindi film industry inspite of a passing reference to Tamil cinema. Not only should it be a sticky here on the forum but should be required reading for any new film director. Rajen, you’re much too kind.. thanks so much! my first article that I read after prelims & that too a satyam classic revisited …had readed original @ ng…..
this is satyam at its best! Thanks Rooney.. I originally wrote this in the context of OSO but I’ve edited and reworked that piece considerably. At the same time I’ve added observations from elsewhere as well as revised things a bit here. I thought of making this a more ‘formal’ piece overall but then a mix of the ‘high and low’ is perhaps appropriate for the subject! I can’t second Q and Rajen’s suggestion enough. If you can find a way to embed this piece within the main SS page, I would do so very soon, Satyam. So much of what you discuss (in general and with regards to Hindi cinema) on this blog and elsewhere dovetails consistently with the many ideas of this massive, masterful piece. 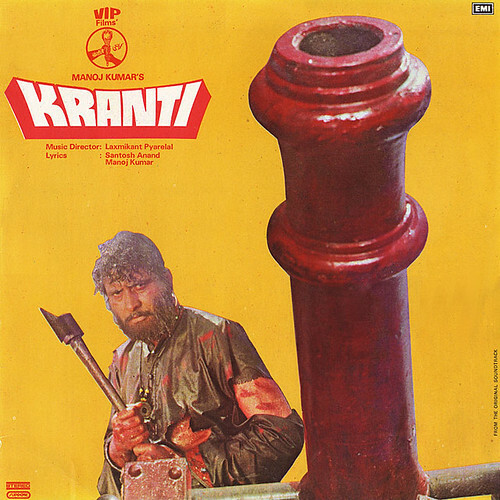 That’s exceedingly kind GF… will do so later today or tonight..
Oh, and I haven’t seen Kranti, but that has to be the most audaciously phallic film poster I have ever seen. LOL! And this film is (if the company will excuse me here) quite a contest between two aging (or aged) stars trying to get it up! Oh, well, now I have to see it. Not to mention Shatrugan Sinha trying to outbellow everyone else. Ha! True! Not to forget the ‘catfights’ here where most stripping by the protagonists is not possible! Or even the very same deciding to take those dips in the water as a war rages on elsewhere. 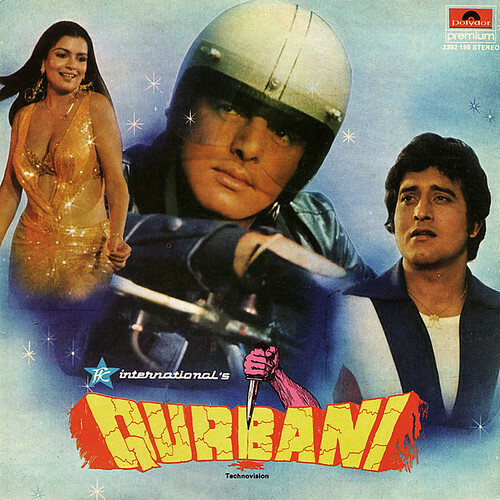 One of the most over the top Hindi films imaginable but nonetheless a great guilty pleasure. 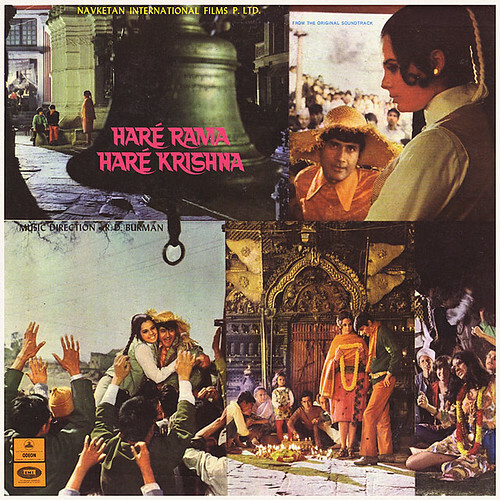 Always wondered why I liked this when I actually quite dislike every other Manoj Kumar film. One day I discovered that Salim-Javed had written the script! But either way this is a twisted film and there’s a lot here that revolves around hooks and blades and arrows and so forth! RE.- And this film is (if the company will excuse me here) quite a contest between two aging (or aged) stars trying to get it up! When Satyam was a bit loosened up !! LOL !! KRANTI is a masala riot GF! Great piece here Satyam. I agree it should always be accessible to everyone. I’ve added the post to the sidebar guys.. thanks all once again..
simply superb post with superb posters. will have read it again- Fursat se !! Thanks Rocky, the posters (really LP covers) are indeed evocative. In fact (and I always wish I were older and had lived through this favorite period of mine) the entire movie art of that period included not just the obvious posters but also the lobby cards and the LP covers and so forth. It was an entire culture that vanished. I keep recommending Ardashir Vakil’s otherwise ordinary Beach Boy for its opening chapter where Haathi Mera Saathi is playing somewhere and the whole paraphernalia of the balcony is beautifully represented. Wish there could have been an entire novel on this sort of thing. The only element Bombay film culture lacked and which has always been available in the South is the gigantic ‘cutout’ (filmstars and politicians). The Stalinist implications of such imagery are disturbing at one level but it’s great fun to see these all over the place (though again it’s in decline even here partly because the proliferation of visual media perhaps makes this kind of ‘advertising’ a bit redundant). Those days having a film on Cinemascope used to be big. 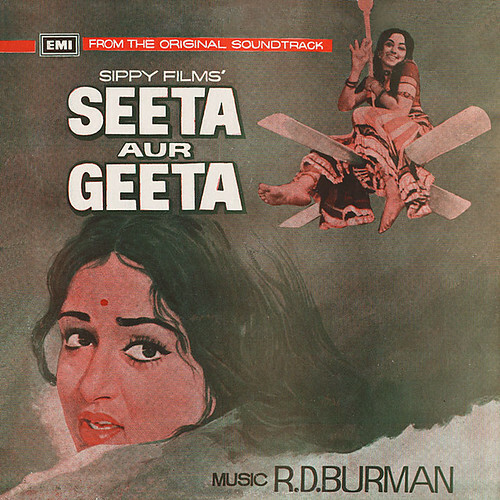 I remember Prakash Mehra adopted Cinemascope eary on but Manmohan Desai resisted it for some some time ( Coolie was not CC, neither was Mard I think), his thinking was if the film is good why incur extra expense. Sholay offcourse as can be seen in above poster was in 70 MM. Advertisements also would highlight this- Dekhiye MKS- Cinemascope mein- Bade Parde par !! 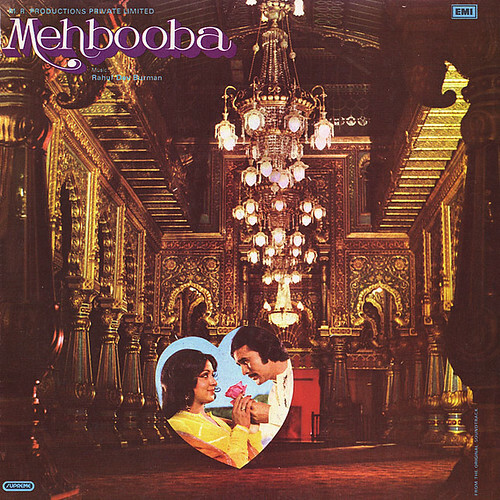 I still remember looking at the covers of various LPs for hours when my dad was not around. Golden stuff Rocky… you should share these reminiscences as often as possible..
Incidentally I’ve updated the posters once again..
Prahar’s poster is simply awesome !! Excellent post. THe posters are cool, Brings back the old memories. I totally agree if OSO was tribute to 70’s as claimed by SRK and Farah, how come that they missed Amitabh..He was at high in 70’s. SRK did it on purpose. Rajesh I think Bachchan as someone completely relevant even today could not really be treated as a ‘fossil’ or an object of ‘derision’ which is what everyone else was subjected to more or less. There’s a difference between loving homage and condescending humor. Now that awards moment later on in the film was genuinely funny. getting back to Bachchan he’s there for just one scene but I liked his somewhat supercilious ‘Om, who’s Om?”! Great writing here, the collection of posters you have are huge! Re: the sidebar posters: great selection here, although I wouldn’t want this bunch to stay too long! What dilip-film is mazdoor? Somehow I don’t think i have ever seen this. Random: the other day saw Zalzala on TV after maybe 20 years…man this was bad, but fun. Both dharam and shatru are sooo past it, and rajiv kapoor never had it (actually neither did shatru if one compares him to dharam). the choreography on the “zalzala zalzala” song has to be seen to be believed! Zalzala is a useless film! 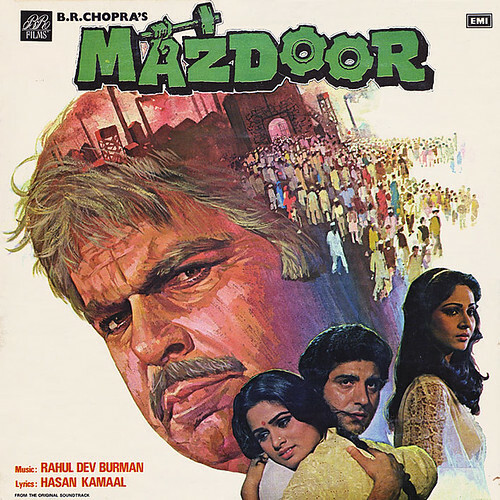 Mazdoor is a Ravi chopra film from the 80s with Dilip Kumar and Raj Babbar. It’s fun if you can stand the domestic tearjerker along with Dilip Kumar as hero of the lumpen masses! And of course this is part of Dilip’s bombastic 80s phase! maybe the presence of babbar explains why I had blotted this film from my consciousness. [I remain traumatized by a film wherein Raj Babbar flexes his non-existent muscles in a banyan, saying “body dekhi hai meri?”]. Superb piece Satyam , kudos to you . No piece has caught the sentiments I feel about the loss of masala cinema like this one has and what’s wrong with Bwood even today and the damage that started in the ’80’s . Every good maker in the ’70’s had a theme they believed in and crafted every movie of theirs to that end just trying to tell that story time and again but not preaching and turning it into so called art cinema . These men were true film makers who never got enough credit for their intelligence , knowledge , wit and vision , that they co existed without ever copying the others styles or themes and kept up the ability to get their writers to find new and interesting ways to repeat themselves and please the masses at the same time always goes unnoticed by many . They didn’t copy hollywood there was no need as the work they produced was probably more superior to most of what hollywood churned out in the ’70’s . It’s a shame hollywood turned to the action genre for the ’80’s which meant the upcoming makers in bwood turned away from what made them unique and equal and decided to copy what they thought the masses wanted without the finance and technology . Thereby losing the art of storytelling and putting messages across in the movies like only bwood could . Good , intelligent and educated writers became obsulete to make way for proposal makers who wanted to just put up a spectacle on screen and make bad copies of hollywood movies . Now we would call them B grade hollywood movies but in the ’70’s most of what hollywood made was of that quality and that was what the new makers of the ’80’s wanted to copy rather than realising they had a superior product at the time . So instead of developing and harnessing something unique that could have made bwood a major rival to hollywood they seemed embarrassed by it and so decided to copy the west instead maybe they didn’t realise that especially in places like the middle east , Africa , southern asia and Russia bwood was the chosen viewing pleasure over hollywood fares . Thereby setting Indian cinema back decades which they can’t recover from . It’s a shame that something that unique and true to itself never had the chance to grow into what it should have been . Thanks very much Aramak. Great comment here.. I have never understood what “masala codes” are there in JBJ. I find it a thoroughly “modern” film with nothing masala-like at all. As I mention in the piece I think Shaad Ali uses ironic distance as a mode with respect to the tradition. I find this move problematic (even if this seems to be the preferred mode for many) for reasons I’ve discussed here and elsewhere. But Shaad Ali nonetheless engages with a masala model. He is cognizant of that history. JBJ isn’t masala in any true sense. But it is involved with that tradition much as BnB is as well. Thanks Q and Satyam for your comments and good readings on JBJ which is my favourite Abhishek comedy and one I find quite superior to Dostana and mainly for the reasons you both state out . JBJ for me is masala , the characters are real even if the scenario’s aren’t and that for me is masala cinema . The problem most of the audience had with it in my view is that it seems rushed and they probably couldn’t connect with the characters and situation quick enough and get what was happening before the movie ended . Shaad made a masala movie in hollywood time and that was his failing as Bwood dictates that you get to know your characters first before you understand and care about them , while hollywood assumes you care and understand them almost straight off . Being british meant I understood and knew the characters while most other viewers didn’t have that to make the connection . Dostana really faltered in the second half. They just couldn’t carry the energy over from the first half and furthermore ‘Johar-ized’ the film. Word now is that the sequel might not have John but either Imran or Ranbir. Not sure about this switch. I think Abhishek and John worked well together. But also John can be the ‘body’ in a way those other two cannot. Actually doing Dostana 2 with Imran/Ranbir wouldn’t be a bad idea either! I also did suggest once that Abhishek/Imran would be interesting in the right film. Just not sure the Dostana pair should be broken up for this. But Johar has one eye on the market at all times and having Ranbir or Imran in place of John makes the casting fresh. On JBJ I found the second half funnier but the first was the more interesting one in terms of the overall structure. The fantasy element. But the problem here was that the content within the frame wasn’t as good as it might have been. I love the train station sequences and so forth but the Abhishek portions in Paris are a bit flat, the Bobby portions in this part are simply poor. 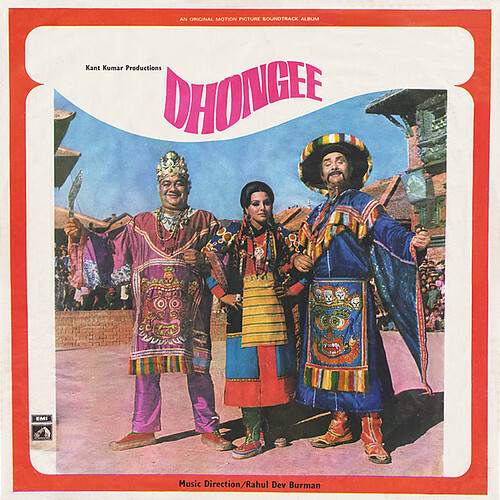 Bol na halke is incidentally a remarkable video to my mind. Overall though I can’t say that this is a movie I like as much as I perhaps initially did. And this is an enormous piece Satyam! satyam,I don’t agree that bachchan is relevant today as other stars.In OSO Dev Anand,Manoj Kumar were shown in a derogatory way. Dharmendra,Rajesh Khanna were shown in a respectable way. 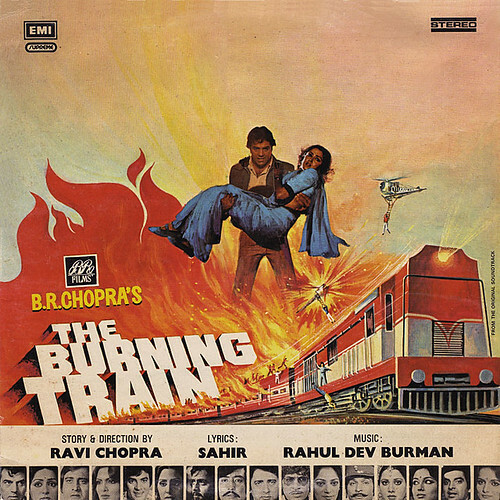 Rajesh Khanna appears in a role as well. I always wanted today to say this.This is the secret many didn’t understand. 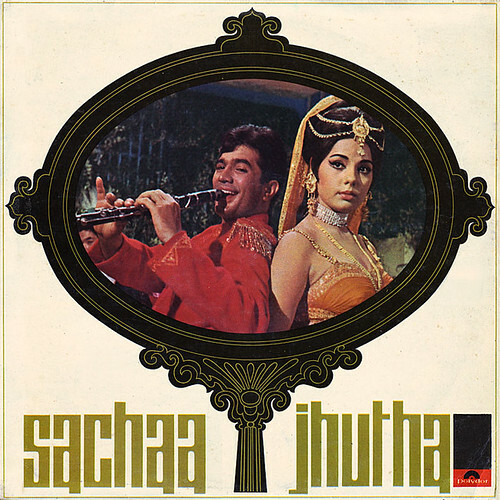 Satyam,who do you think Bachchan of 1970s is? IT IS shahrukh himself.Shahrukh always wanted to be Bachchan. Always Wanted to take the place of Bachchan in hindi cinema. By ignorig him in the 70s,80s era and playing a charecter in that era shahrukh projects himself as bachchan.That is the biggest star in hindi cinema.Ignoring Amitabh is a well planned move. Shahrukh gives enough hints that he is bachchan.By Amitabh saying om kapoor who? he deconstructs his stardom. Amitabh is not relevant as other stars.But his superstardom has the biggest reach till now.Eventhough playing charecter roles,the impact of his superstardom is the biggest. At that time shahrukh was at the top of his game.Now he is almost fimnished. I totally disagree, but it still well written Sunil. I agree on one point though. Amitabh is a legend. “Ignoring” him is a good move imo in OSO (not the better one though), because SRK already had enough problems in the past with all the controversies about replacing him in KBC etc. The entire idea was to make a spoof of the 70’s era. If Bachchan was included, it would be such an outrage for the fans that it would’ve hurt the film badly. Even trying to make an homage by showing him in flesh and blood would be criticised, and actually won’t be in the spirit of the film. I find rather unfortunate that in indian cinema, it’s difficult to make fun with stars images but that’s how it is. So i don’t think we should take everythink that SRK do like an evil deed to undermine “God’s” achievment. He’s a producer with a potential Blockbuster in hands, would you take such a risk with a 30 or 40cr budget film ? Cinema is also a business. Came from the movie and loved it! My first movie of the year which I completely enjoyed. Seamless narrative and even though the story isn’t unsual (we’ve seen elements of it in DCH and Lakshya), Ayan’s mature handling makes it unique and very fresh. There are certain fine touches to the movie and some parts are so well-done, it made me teary-eyed on more than one occasion. Not just Ranbir (ace of course), but everyone from Konkona to Anupam Kher (very restrained performance) to Supriya Pathak (wow!) to all his friends in the film have given very credible performances. And yes, then there are the songs, esp Boond Boond, which really touches a chord. Must see! Take a bow, Karan Johar. Certainly a notch above all the films he himself has made. cool sandy thnks ..but it is worth after watchinbg dch, lakshya..good performance ok..but anything new..??? Good to hear, sounds promising! hope Ranbir geta a full fledged hit in this one…. The biggest misconception I found with what Sunil had written (yes kept me thinking on the bus home) is that SRK IS AMITABH! If that is indeed the reason AB is left out of OSO, then it makes the film a tad lamer as SRK in this era (or any other) couldn’t hold a candle to AB. Oops: I disagree that there would’ve been an “outrage” had it been done tastefully. AB films have been spoofed many times Hindi cinema, and incidentially there are some pretty funny mimicry artists who do a wonderful take off on AB (Raju Shrivastav). BTW i’ve put this post up on my blog too..it’s gold! “People are are all too happy seeing Hollywood Generation X films made into small budget clones in Bollywood to ever dream of returning to the epic challenges of J P DUtta (in the 80s to be exact.. the one director who did ‘update’ masala but was perhaps too late..). No audience nurtured on Kuch Kuch Hota Hai will ever be able to digest Ghulami!”-love this line! SRK doens’t think like that masterpraz.Shahrukh fans think that he is the Amitabh of today.The main aim to superimpose srk as amitabh irrespective of whether its true.It doesn’t have to be true. You have read street’s topics on NG. Satyam i am sorry but you seem to have overstretched it now.BIG B is legend but that does not mean you have to degrade/ridicule SRK in your blog. It becomes all the more prominent that by trying to degrade SRK you make him all the more important. I personally consider that not even BIG B can stand in front od the ‘Abhinay Samrat’ Dilip kumar. But does that mean i start degrading BIG B to make Dilip saheb look greater. All demi-gods fall. Big B had his fall. He fell badly between 90-97.Period!! But he resurrected himself.Kudos to him but then he does not command the same popularity now. Does Sunil Gavaskar enjoy the same popularity today? No!! But yes he still commands the reverence..same goes for Big B.You always are perplexed between popularity and reverence. SRK has been the toast of the nation for two decades now almost.He is the current superstar.Accept some facts or else blind worship shall kill you. i dont love SRK but then that does not mean i ignore the truth.Like i didnt ignore the fact that aamir is the current top draw at BO. The way you have tried projecting a crap movie like Raavan by hyping it as a movie to feed the neurons of intellectuals/pseudo-intellectuals is grossly to be condemned. One can have views..good that you have one but then going to the extent that you criticized the same single screen audience that made your Big B ‘demi-god’ and praising the multiplex audience whom you always criticize to degrade a SRK/HR movie just to save raavan is such a hineous act.Period!! Jr.Bachhan is a flop star from day1.TTry opening 100 blogs..sstill he won’t earn more than 50 crore ever for any of hsi solo movie.D2 was HR all the way..who saw Jr.Bachhan..none!!! just wait for dum maro dum..it will cross 50 cr..period!! This is great post to revisit .